In this new series, built structures meld into those from the natural environment, to test how economic, cultural and social structures shape the world in which we live. Each painting is carefully assembled so that the logic of these structures is matched, such as the tiers of scaffolding and waterfalls, or the peaks of shelters and mountains. These paintings explore who has built what, who takes ownership, and who has the right to the land. Atmospheric in scale, they assume the perspective of the historically marginalised, to revise grand narratives in contemporary painting. Kevin Chin opens the Vancouver Arts Centre program for the new year with an artist talk. He provides insight into the development of his painting which won the Albany Art Prize, ‘Sheltered,’ and gives a preview of his upcoming exhibition, ‘Structural Equality,’ discussing the themes of structural inequality explored in this new series. Click on the image above to listen to an excerpt. Kevin Chin is spending December as artist-in-residence at the Vancouver Arts Centre, in Albany Western Australia. The residency forms part of the Albany Art Prize won earlier this year. 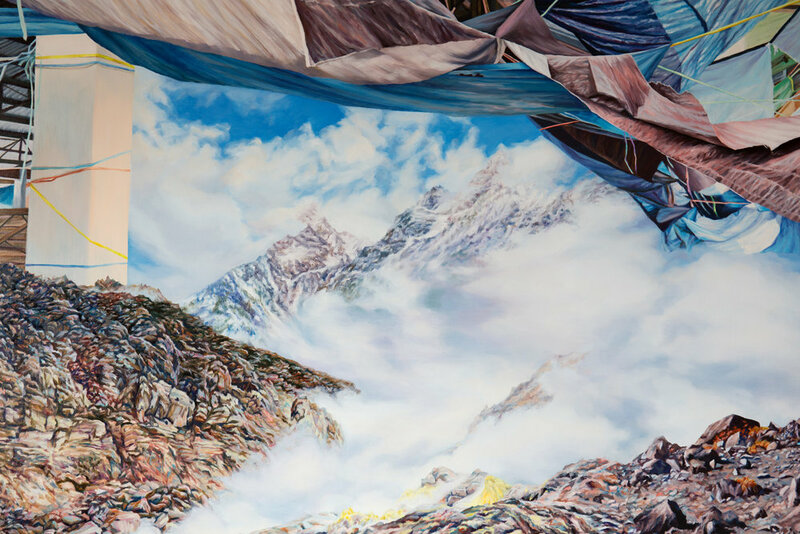 Kevin Chin is a second-time finalist in the $20,000 John Leslie Prize, with his new painting, Peaks (detail shown). 59 finalists have been selected from 497 entries, to celebrate the best of Australian landscape painting. At his first showing at the Sydney Contemporary art fair, with Martin Browne Contemporary, Chin will debut the first painting of his new series (detail shown). To be shown in full in May 2019, this series investigates the intersection between urban and natural structures, and what this in turn reveals about social and political structures. This group exhibition features represented artists in the stable of Martin Browne Contemporary. Other artists include Tim McMonagle, Monika Behrens and Ildiko Kovacs. Kevin Chin is showing for the first time in New Zealand, as part of a group exhibition with Martin Browne Contemporary. Other artists include Tim Maguire, Fiona Lowry and Michael Muir. The Auckland Art Fair will showcase galleries from around the world, including New York, Tokyo and Santiago. Kevin Chin is the winner of the $25,000 Albany Art Prize, selected from 30 finalists and over 300 entries. 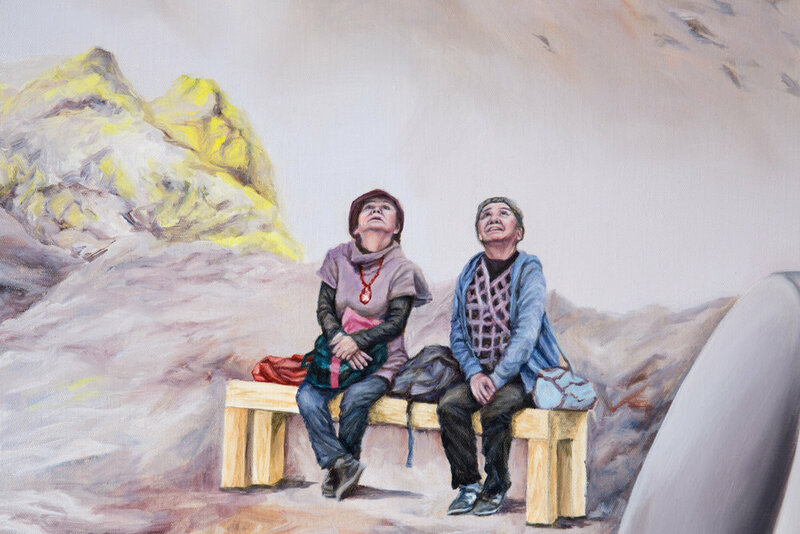 His painting, Sheltered, restages references to the global migrant crisis, such as children standing in queues, and the haphazard temporary shelter structures associated with refugee camps. Piecing together such potent symbols, he translates them through his own personal migrant experience, bringing them into the context of the Australasia region. The tumultuous paintwork speaks to a sense of being in between places, and the troubled conditions of this sociopolitical situation. Curated by George Adams to survey innovations in contemporary painting, the 17 artists include Kevin Chin, Will Cooke, Fernando do Campo, Stefan Dunlop, Neil Haddon, Irene Hanenburgh, Brent Harris, Matthew Harris, Daniel Hollier, Belem Lett, Ollie Lucas, Tara Marynowsky, Nuha Saad, Kate Tucker, Megan Walch, Tricky Walsh, and Ian Williams. On residency at Teton Artlab, Kevin Chin will present an open studio of work in development, and give an artist talk elaborating on his creative processes. He will discuss his US research into the recent changes in the Trump administration, delineating who does and doesn't belong, comparing this to recent immigration and refugee issues in Australia. 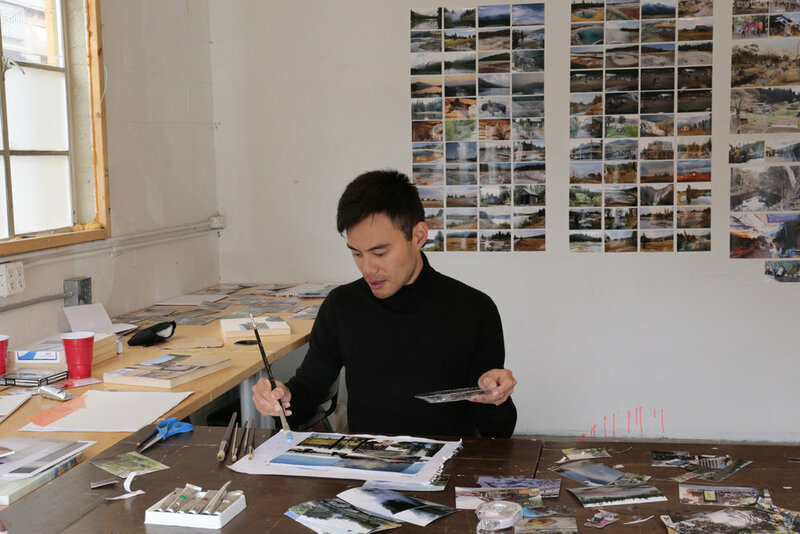 Kevin Chin has been awarded a much sought after Career Development Grant by the Australia Council, to support an upcoming residency at Teton Artlab, USA. This residency program has supported many high-profile American and international artists, including Chuck Close and Alex Katz. Kevin Chin’s new paintings are made in the context of the global migrant crisis, the resurgence of political parties like One Nation and Reclaim Australia, the US election of Trump, and continuing debate around nationalism, belonging and alienation. He takes potent iconography - such as temporary shelter structures, children in queues, and long distance crossings – and restages them through his own lived experience. In this way, he creates new images that bridge our shared experience, exploring universal themes of journey, transition, and sanctuary. Curated by Elizabeth Gower, this large-scale group exhibition features celebrated alumni from the VCA, in honour of the art school's 150 year anniversary. 350 artists were invited to make a 9x5" work on board, including Patricia Piccinini, Nicholas Mangan, Louise Hearman, and David Rosetzky. As part of the group exhibition Closing the Distance, Kevin Chin will be one of four guest speakers on this discussion panel. Topics will include how globalisation has affected cultural discourse, and how shifts in cultural boundaries are directing artistic approaches. The panel will be chaired by Dr Kristen Sharp (Senior lecturer in Art History and Theory at RMIT University), and panelists also include Rachel Marsden (Lecturer in Art Curatorship at The University of Melbourne), and Nikki Lam (Curator and Visual Arts Editor of Peril magazine). Kevin Chin has been awarded a globally competitive artist residency at Teton Artlab, USA. At the base of Yellowstone National Park, the residency is surrounded by geothermal activity and unique land formations. The residency will allow Chin to spend a whole month sourcing otherworldy landscapes and peculiarly American shelter structures to incorporate into paintings. Curated by Sophia Cai, this group exhibition brings together twelve Australian and international artists to explore contemporary issues of migration, place and the Chinese diaspora. In the catalogue essay by 4A Director Mikala Tai, she writes, "With the delineation of borders and the constructs of us-them, majority-minority and centre-periphery proving to be political tools of division, Cai has gathered a suite of artists that refuse the constraints of such binaries... They carve out futures informed by cultural connections and are buoyed by the experience of globalism." Artists also include Pei Pei He, Pia Johnson, Lindy Lee, Owen Leong, Eugenia Lim, Chun-yu Liu, Jason Phu, Cyrus Tang, Guan Wei, Shen Wei and Louise Zhang. In the exhibition foreword, curator Angela D'Elia writes, "For many of the exhibiting artists, gardens hold a special place, recollect a special memory or are an integral part of their lives. For others, there are concerns about the environment and sustainability, but they were all influenced in their practice in some way by the cycle of life in our gardens." This cross-form group exhibition also includes Judith Bradhurst, Anna Culliton, Nicola Dickson, Dimity Kidston, Emilie Patterson, Joan Ross, Barbara Ryman, Erica Seccombe, Bic Tieu, Emma van Leest, Paul White, Kayo Yokoyama and Carolyn Young. 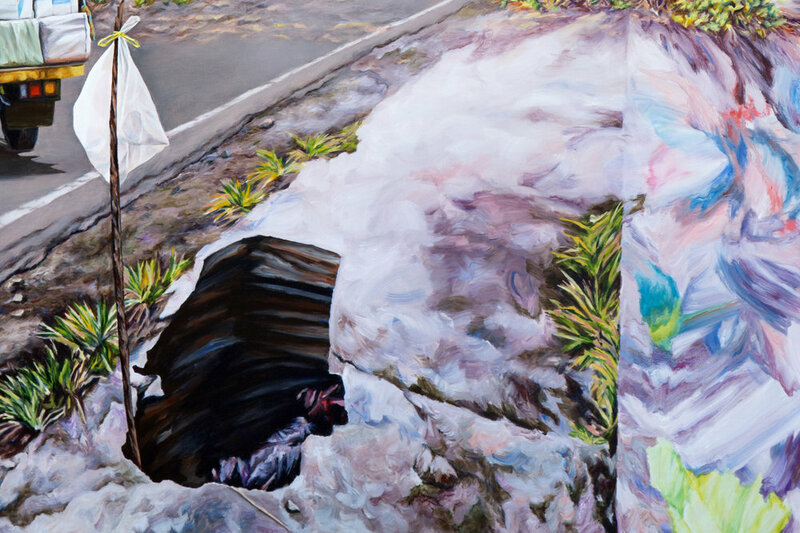 The $20,000 biennial award run by the Gippsland Art Gallery showcases the best of contemporary landscape painting. Kevin Chin's entry, 'Crossing,' is a personal reflection on the world refugee crisis, and the experience of crossing borders and being in between places. It is a compassionate response to the ongoing Australian debate around 'illegal' boat arrivals. The exhibition of finalists includes all visual art forms, and demonstrates a belief that cultural and creative expression can be used as a means to affect deep and lasting social change. Kevin Chin's entry, ‘Veils,’ is made in the current Australian context of anti-Islamic protests from groups such as Reclaim Australia, and questions media imagery of head coverings that vilify otherness. The action of veiling is used as a painting motif to discuss issues around belonging and intercultural misunderstanding. Kevin Chin is a second-time finalist in the biennial $15,000 Redland Award in Queensland, celebrating the 30th year of the award. He was awarded second prize in the last round of the award in 2014. This group exhibition across artforms explores the junction between facts and activism. Kevin Chin's painting, 'It's a Sign,' plays on the saturation of coded information from which we make decisions about our direction in life and political standpoints. With his evocative painting 'Ripple Effect,' Kevin Chin is a finalist in the $50,000 Len Fox Award, held at the Castlemaine Art Museum biennially to celebrate the memory of the influential Australian painter, Emanuel Phillips Fox. Judged by Dr Rex Butler, the 43 finalists also include John Nixon, Abdul Abdullah and eventual winner, Prudence Flint. Blurring the boundary between real and imagined these artworks challenge traditional representations of landscape and allow the viewer to imagine life in a new world. Curated by Kent Wilson, artists include: Andrew Mezei, Tony Lloyd, Connor Grogan, Christie Torrington, Alice Wormald, Kate Shaw, Ara Dolatian, Ben Taranto and Kevin Chin. Inspired by Magic Realist literature, Kevin Chin's new series of large-scale oil paintings re-envision the world from the perspective of the cultural ‘other.’ Drawing from migrant and travel experiences, Chin’s colourful assemblages create impossible places we may long to be. Curated by Diane Soumilas, this exhibition addresses the notion of the garden as a sanctuary or site for reflection, contemplation and healing in contemporary culture. Artists include: Natasha Bieniek, Jane Burton, Kevin Chin, Siri Hayes, Ponch Hawkes, Christopher Koller, and Janet Laurence. Julie Skate curates a sprawling solo exhibition of new work by Kevin Chin, to be opened by Dr Vincent Alessi. In the catalogue essay by Claire Anna Watson, she writes, "Things are not quite as they seem in the world of Kevin Chin. He marries the banal with the fantastical. His is a mystical and transcendental discourse where inner states of tranquillity and equanimity are cultivated across all life forms including inanimate objects. It is a realm where dream states rule, a place we can only ponder if it’s truly worlds away." Kevin Chin is a second-time finalist in this year's Fishers Ghost Art Award (Open Section). Held over 10 days the Festival dates back to 1956. The Open section of the Award, worth $20,000, includes all art forms. Kevin Chin's painting, 'Via Swan,' is a finalist in the biennial $25,000 Whyalla Art Prize. The more marginalised and awkward romance seems to become, the more it locates the perfect place to hover. The 11 artists in this group exhibition also include Irene Hanenbergh, Grant Nimmo, and Cybele Cox. Curator Amy Marjoram says of Kevin Chin's painting, 'Out to Dry,' "The fractured image suggests the moment of touristic transport, the romanticized ‘escapist fantasy’. The tourist attraction, like the romantic narrative, needs to be exotic enough to appear exciting whilst accommodating familiar expectations. We all visit the same ‘undiscovered’ places." The $25,000 prize was won this year by Richard Lewer, with other finalists also including Stephen Haley and Alice Wormald. Kevin Chin's painting, 'No Rest,' is a finalist in the $50,000 biennial prize showcasing the best of Australian contemporary painting. Other finalists include Shaun Gladwell, Jenny Watson, and eventual winner, Guan Wei. Freak of Nature brings together various artists working with plants, nature and the uncanny. Using a variety of mediums ranging from painting to collage and sculpture, each artist explores and transforms the natural world into surreal fantasy. Curated by Danielle Hakim, featuring works by: Kevin Chin, Ara Dolatian, Claire Gallagher, Georgina Glanville, Mark Rodda, and Paul Williams. Across artforms, the biennial $25,000 Keith & Elisabeth Murdoch Travelling Fellowship enables VCA School of Art graduates to travel abroad and enjoy a measure of financial support during the early years of their professional careers. Kevin Chin is amongst this year's finalists amidst a strong field including Simon Finn, Melanie Irwin, and Hannah Raisin. Kevin Chin has been awarded a highly sought-after Australia Council ArtStart Grant. As part of his year-long project, Kevin will undertake a mentorship with the renowned Stephen Bush. With his multi-panel work, 'Pass By,' Kevin Chin is a finalist in the Nillumbik Prize, celebrating artists with a connection to the Nillumbik region. This year's judges include Melinda Martin, Director of Linden New Art, and Michael Brennan, Senior Curator of La Trobe University Museum of Art. In his review in The Age, Dan Rule describes Kevin Chin's new work as, "at once contiguous and gently disorientating. Chin merges minute details and softer, hazy tones, creating a contemplative, dreamy atmosphere." 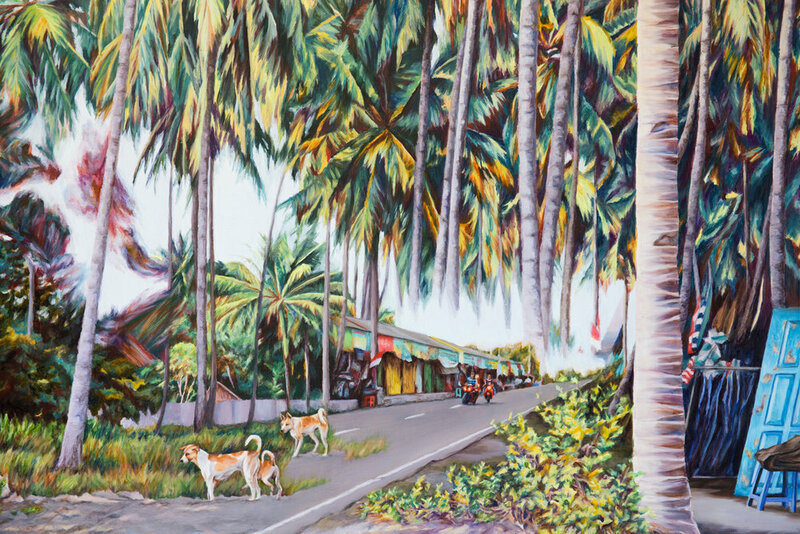 Chin's ambitious new solo exhibition is also featured in the Apr-Jun issue of Art Collector.